Funny and fascinating. 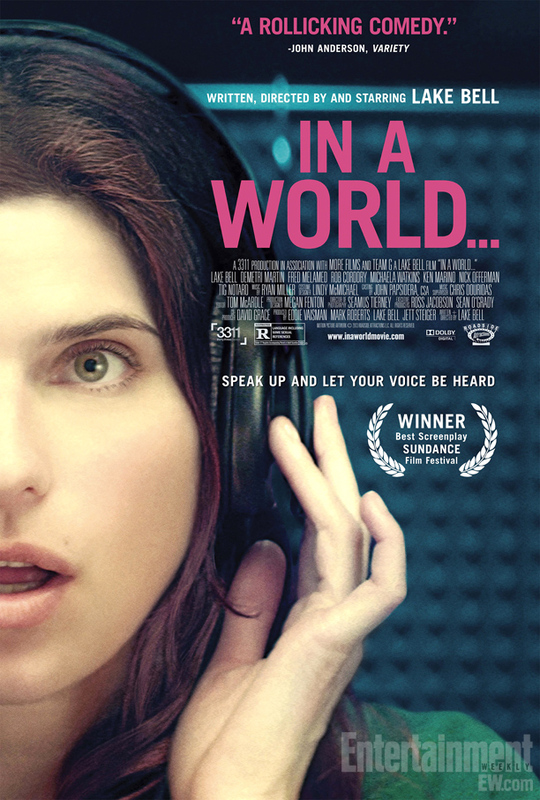 In A World lived up to my expectations, as I enjoyed the Fresh Air interview with the writer and star of the film, Lake Bell. The title is the catch phrase the king of voice-overs used as he dominated the profession like nobody else. The movie wasn't so much about the late Don LaFontaine as about the industry itself. For those of us who've earned a modest living behind a microphone, it is especially intriguing because a relative view voice actors command astronomical sums of cash. We've all heard their baritone voices on movie trailers, commercial spots and narrations of every kind. But what makes their voices so special? Unfortunately, the movie doesn't really address that very well other than to feature guys with deep, deep tones. It's a comical look at the top voice actor in the business who gets upstaged by his own daughter. Women have not had many opportunities in this voice-over industry and even the father of one of them was loathe to have her steal one of his jobs. Lake Bell, who wrote and starred in the film, reminded me of Tina Fey. Bell has this quirkiness and self-deprecating way that made her an endearing character. The movie is smartly written and moves along very quickly. I recommend it. Posted on September 8, 2013 by Steve Busalacchi.